This is Digital Clarity Group's Partner Finder marketplace. The purpose of this site is to help enterprise buyers develop a detailed and meaningful understanding of the potential digital partners they could choose to engage for a current or upcoming marketing technology initiative. If you're interested in listing your organization on the Partner Finder, just follow the steps below. If you still have questions, check out our FAQ or contact us. Decide whether you are going to create a Basic vs Premium Profile. If you want a Premium, sign this Agreement. Add a partner profile. You read this documentation to help you along the way. Email us to let us know when you're ready to publish your profile the first time. After we publish it initially, any of your changes will be reflected immediately going forward. Improve your findability. The sort order of the search system prioritizes three things: 1) the partners' VOCalis scores based on voice-of-customer feedback, 2) premium profiles, and 3) the popularity of the profiles based on visits / traffic to the profile pages in the last 30 days. While the VOCalis scores are not yet being shown on the profiles (they will in the future), they are based on the surveys received by customers, accessible from the top of each profile. Partners should encourage their customers to provide feedback in this means. Of course, if you have questions, comments, or concerns, please contact us. The purpose of the Partner Finder is to help your organization connect with ideal prospective clients for your organization. This is accomplished by providing a complete and accurate profile. Please consider the following, high-level tips and recommendations for getting the most out of your Partner Finder profile. Complete your profile to the very best of your ability and follow all guidelines carefully. Increasing the quality of your profile will improve the chances that prospective clients will find it as intended. Most fields provide a help text field to provide useful information while completing the listing process. Please follow these recommendations carefully and let us know if you have questions or suggestions. Please keep in mind that this is version 1.0. We would love your input if think we are missing information that would be helpful, or if you don't see a competency or product in the lists -- we'd be happy to add them. Also, if the directions are confusing, feel free to let us know how we can help to improve them. In order for all this user functionality to work there are a handful of guidelines and requirements to improve the quality of your directory record. Our goal is for potential prospects to find your record as accurately and easily as possible. There are only three required fields for each location. Filling in the rest of the location fields will provide more ways for end-users to find your record when searching for locations using keywords or phrases. We also may have features on the roadmap which will better leverage location data so be as comprehensive as you possibly can. In order to streamline the process of entering coordinates, we've added a Google Maps plugin allowing you to simply drop a pin on a map. The system will then automatically populate the latitude and longitude fields. This data is leveraged when end-users filter their list with the 'Distance From' widget, thus it is not necessary for it to be perfect to your address. Just place the pin as close as you can to the actual location. 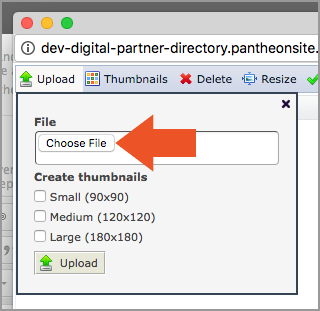 In order to ensure your Digital Partner record is properly displayed, it is necessary to add at least one location which has the Location Name field set to 'Headquarters'. To make this easier, the first location name is set to Headquarters by default, so you should not change this value. As of v1.0 the Directory does not have fuzzy search so it's important to ensure your Location Names are spelled properly. As of v1.0 of the Directory it is necessary to save and re-edit your record to add additional locations one at a time. 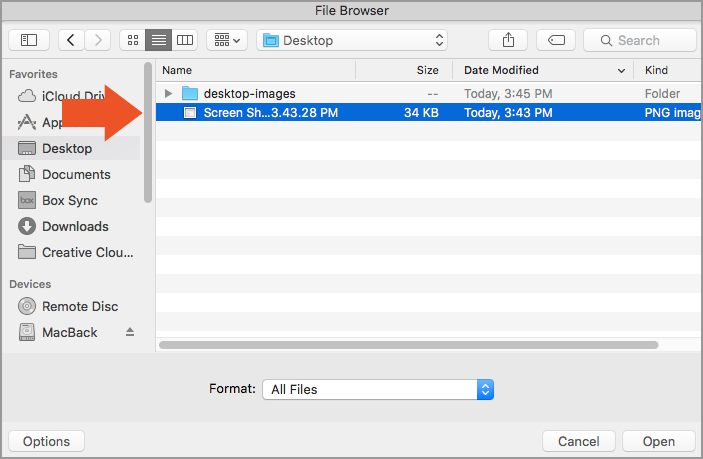 Some fields, like the Partner Overview, allow the addition of images (and files) as part of the content. If you'd like to take advantage of this feature, here are the steps. 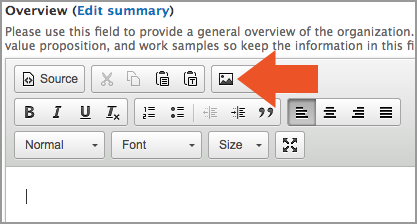 Step 1: Click the little image icon in the tool bar of the text editor. 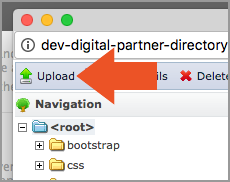 Note: If there is no tool bar on the field you are editing, it means that field does not support images (or any HTML). 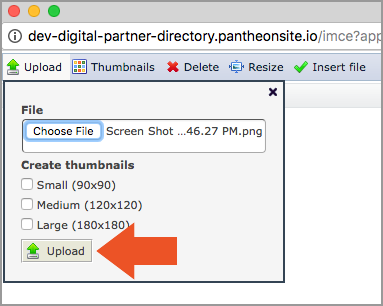 Note: The Upload button is hidden in the top left corner of this dialog window. Step 6: Click Upload. At this point the image will be dropped onto your page. 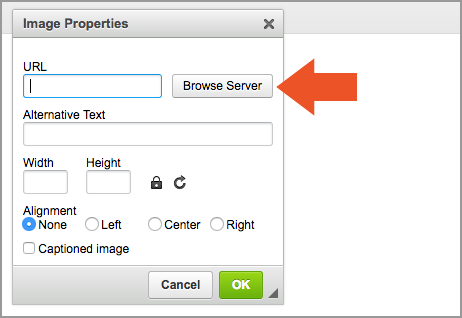 Step 9: Be sure that the "Text format" field under the editor window is set to "Full HTML". 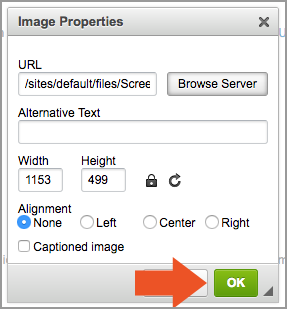 "Filtered HTML" and "Plain Text" will not display images.